Buckle up, BOTpeeps! Today’s strip marks the beginning of the Next Big Storyline which will answer questions many of you have been asking since the beginnings of this comic. I’m not going to spoil anything by revealing exactly what’s going to be covered in this arc, but I will say that a lot of the seeds that have been planted over the past 500 strips will come to fruition and I’m extremely excited to finally share them with you. So excited that, if all goes according to plan, I’ll be ramping up production of JEFbot from two strips-per-week (Tuesdays and Fridays) to three strips-per-week (M-W-F). I’m hoping to make that announcement before the end of the month so keep an eye on the blog space. Anyway, kick back, relax and enjoy the start of this storyline! It’s gonna be a fun ride that I’m hoping will expand the BOTiverse and deepen the characters before the end. 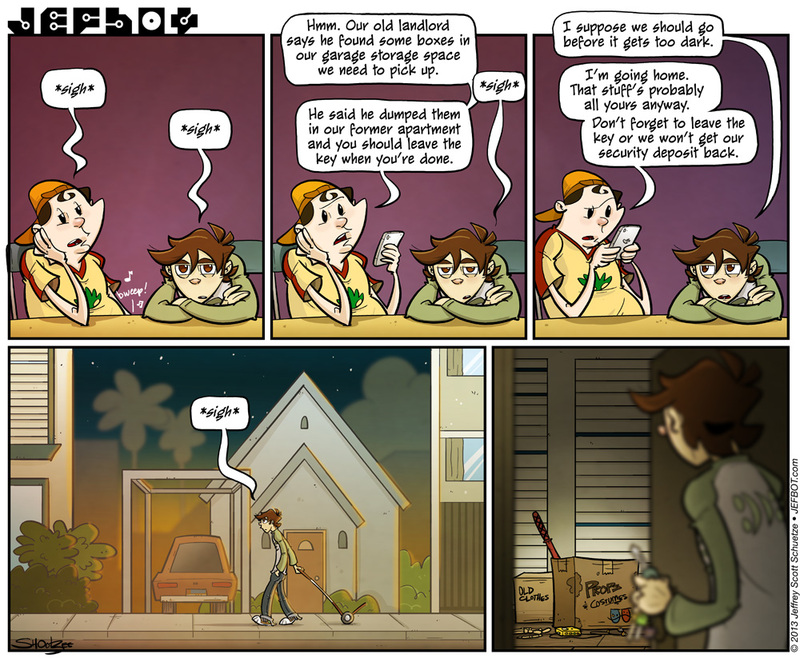 If today’s strip started things off on a solemn note as jefbot continues to dwell on his current situation, come back Friday for a turn of events that will certainly give him more pressing issues to mull. FYI: The Deep Red and Stonewash Green Mouthfuls of Madness Ramen House tees are nearly sold out! If you’re thinking about getting one of these variants and your size is still available, I’d suggest you click over to The BOTshop immediately. Er, did #502 get passed over or does this count as a two-parter? no, i accidentally numbered this strip incorrectly when posting it, Insectoid, so the url will have to be #503 for the time being until friday when the actual #503 goes up. but good eyes! Oh, and happy belated 5 hunny! Would’ve commented then, but I’ve had things to do. thanks for the congrats! and glad to see you back here – hope you got a lot accomplished! and i dig that about them, DAS. heheh. WOO! i know, it’s been a while, Dj. i think the last big story was the Super Scrawn/Angry Scarf arc? feels good to get back to the BOTmythology! Is it just me or do i smell an awesome arc coming ? What? No role playing with old costumes?! Maybe he’ll find his long lost hamster? Good luck with going up to 3 times a week! heheh. glad my little blog post was effective, Shanna! and, yes – we’ll be seeing some familiar faces from the past and some not-so familiar ones, too. lots planned! Been a while since we’ve had a big story line, looking forward to seeing where the goes. Too funny! You could always donate all of it to a children’s theatre company?! very true, FunnyShaffer. might have to do that IRL, too. there had better be a storm trooper helmet in there…. for sure, Maesonic! possibly a Boba Fett helmet, too. So excited about the new arc! Too excited to post anything besides sentence fragments, in fact! Wow, three strips a week! That’s a huge and stressful step for comic writers I hear. I am definitely one pleased reader. Good luck with the extra work, and don’t forget to relax once and a while if you need it! I just read the Twitter post about this strip and I swear I heard it in the voice of Don LaFontaine. Hmmm . . . What costumed arc lurks in the hearts of men? heheh. not even bot knows everything evil or costumed that might be lurking about, Sarah W! but he will. he willlllll…. A storyline that the entire webcomic has been leading up to? Is the angry scarf coming back? The aliens? The Cornfathers birthday job? I’m looking foward to Fridays comic to see what it is. mayyyybe. just wait, GB! this storyline will be the biggest one yet! Is the sword a hint to one of the old outfits? Cause Samurai Jack is coming to mind, Samurai Bot. Oh, I am good. looove Samurai Jack, Nat! as far as the samurai sword goes… well, it may be nothing or it may be something. you’ll just have to wait to see what happens w/ bot’s old stuff. Exciting news! Cant wait for the new story arc. As for Jefbots less than stellar mood, Im sure there are some memorable costumes in those boxes to cheer him up. Cornfathers Darth Maul costume perhaps? woo! glad you’re excited about the new arc, Maryz! If this is going to be a big arc, I can only imagine exactly what you have planned for it. And I can only imagine what you’ll do when you hit 1000 pages. Hmm indeed. And I wouldn’t try to stress yourself out with three updates a week. Maybe doing three every other week would be an option to keep in mind.